Bow section of M/V Selendang Ayu. U. S. Fish and Wildlife Service Response to Grounding/Oil Spill off Unalaska Background Information The U.S. 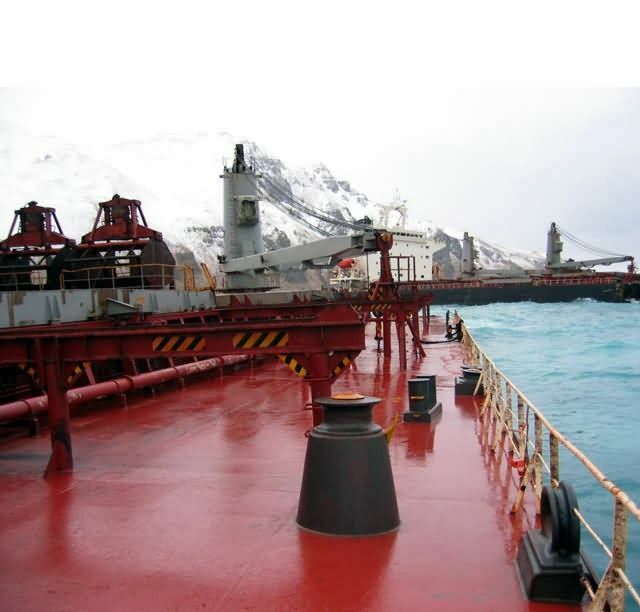 Fish and Wildlife Service is responding to the grounding of the 738-foot cargo vessel M/V Selendang Ayu, off Unalaska Island in the Aleutian Islands. The vessel, carrying approximately 483,000 gallons of heavy bunker fuel oil and 21,000 gallons of diesel fuel, ran aground and broke apart on Wednesday, December 8. Six of the vesselÃ¢â¬â¢s crew members were lost in the rescue effort. The vessel is located between Skan Bay and Spray Cape (53ÃÂ° 38Ã¢â¬â¢ 04Ã¢â¬Â, 167ÃÂ° 07Ã¢â¬â¢ 30Ã¢â¬Â) on the western shore of Unalaska. The area is accessible only by water or air. The lands in the spill area are managed as part of the Alaska Maritime National Wildlife Refuge. The U.S. Fish and Wildlife Service Regional Spill Response Coordinator is directing the Service response from Dutch Harbor, Alaska. The Service response efforts are being conducted within the Unified Incident Command Structure, and Service biologists are directing wildlife response activities within this joint command.